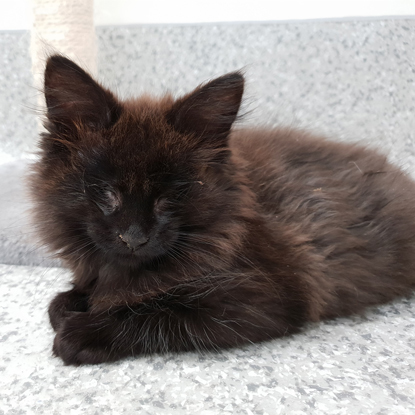 A pair of blind kittens have had vital eye surgery so they are able to experience a better quality of life in the future, thanks to generous donations from the public. The 14-week-old cuties - called Marrok and Rodolfo - are currently in the care of Cats Protection's Mitcham Homing Centre and needed surgery to remove eye tissue. Their operations and recovery treatment are due to cost upwards of £1,500. 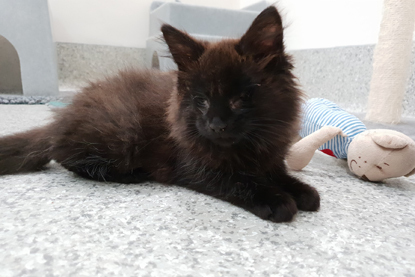 The surgery will prevent the kittens from suffering further discomfort and, although it won’t cure their blindness, it will ensure they lead a life that is as normal and pain-free as possible. Kerri Graffham, Senior Cat Care Assistant at Mitcham Homing Centre, explained: “The cause of the problem is unknown but it’s amazing how well they cope without their eyes. They use the litter tray perfectly and eat, drink and play like any other kittens. They even move their heads closer to the gap under their pen door so they can hear us coming and greet us with a head rub, especially around dinner time! This means they should adapt well to a new home environment despite their lack of sight. “They were given up to us last month because they were being bullied by other kittens in their litter and as soon as they arrived we were charmed by their little characters. They actually looked like little wolves so we called them Marrok, meaning ‘a knight that was thought to be a werewolf’, and Rodolfo, which means ‘a notable and legendary wolf’. Watch the adorable Marrok and Rodolfo in action below. Once the kittens are fully recovered the charity will be looking to find them an indoor home together, without other animals or young children. Anyone interested in their progress can follow @catsprotectionmitcham on Facebook, @CatsSouthLondon on Twitter or @cats_protection_mitcham on Instagram for updates.